HM7 is back in a titanium case with a green sapphire crystal bezel, limited to 50 pieces. HM7 Aquapod from MB & F began its gestation as a horological jellyfish, and the architecture of its Engine is appropriately biomorphic. Jellyfish are radially symmetric, Aquapod is radially symmetric. Where a jellyfish generates power from food caught in its tentacles, HM7 generates power from its tentacle-like automatic winding rotor. And then there’s that bezel. 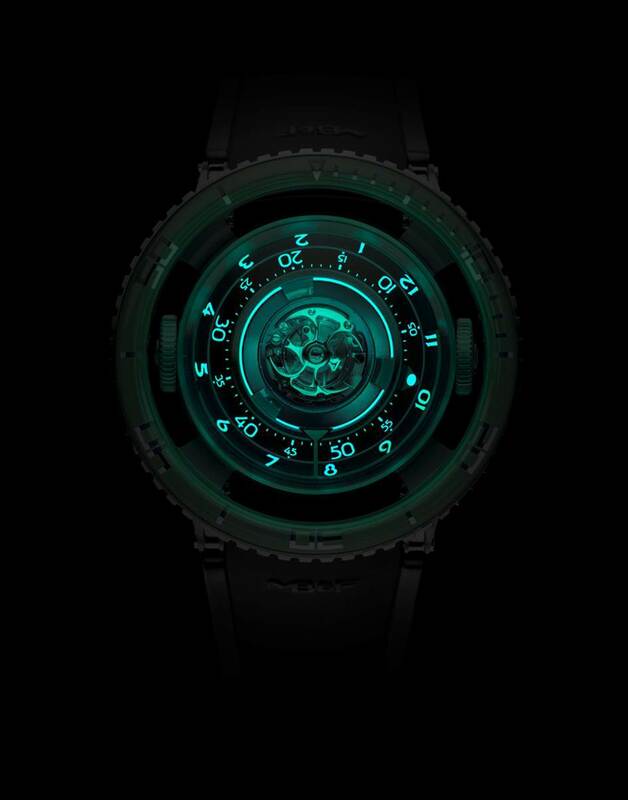 While Horological Machine No.7 is not a dive watch, it is a timepiece comfortably at home in the water – so MB&F added the one element that all serious aquatic watches possess: a unidirectional rotating bezel. However, unlike every other dive watch on the planet, Aquapod’s bezel isn’t attached to the case, but floats apart like a life buoy.The winding rotor’s tentacles are crafted from a solid block of titanium; their very three-dimensional nature makes machining and finishing extremely challenging. Underneath the tentacles, a platinum mass ensures powerful and efficient winding. The 303-component, 72-hour power reserve HM7 Engine was developed in-house by MB&F. 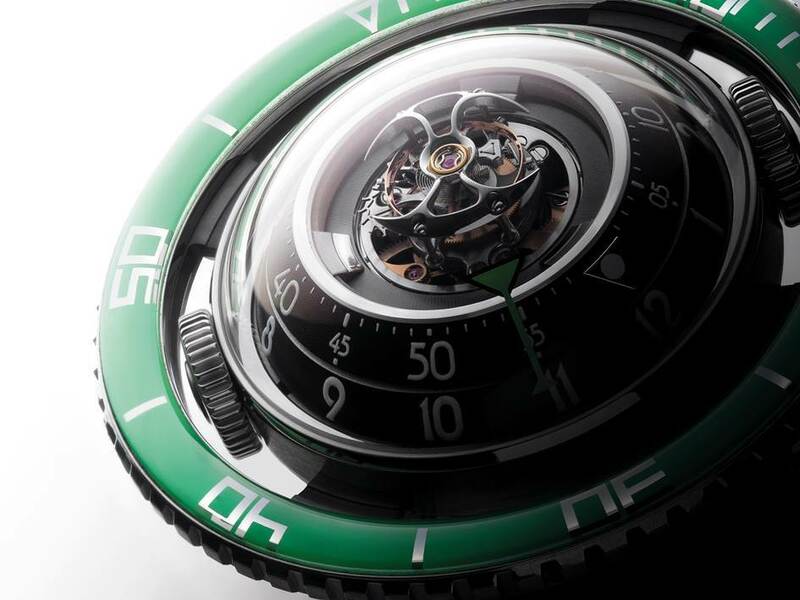 Spherically three-dimensional, all its mechanisms – from the winding rotor at the bottom, past the mainspring barrel and hour and minute displays, to the flying tourbillon on top – rotate concentrically around the centre. 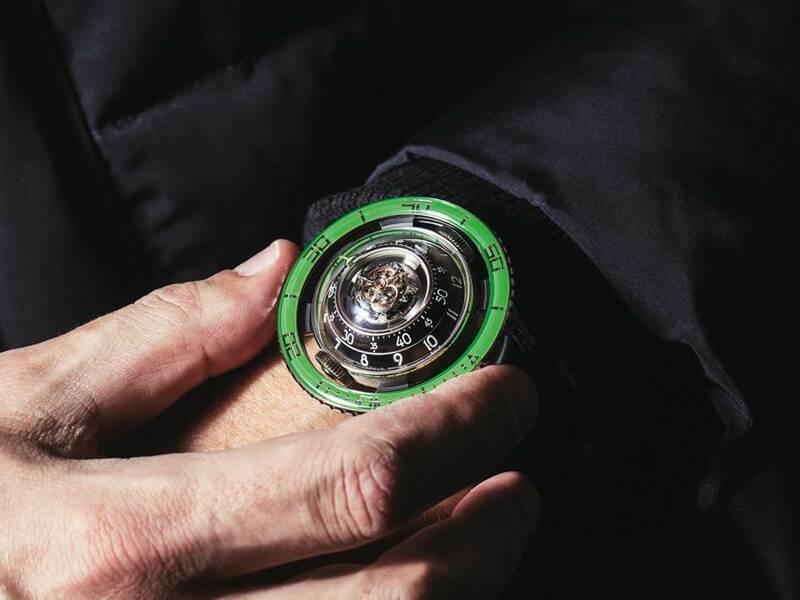 It glows where you would expect it to – on the hour and minute numerals – but also around the inside of the movement, to light up that flying tourbillon at night, and in addition, along the tentacle-like winding rotor so that its operation, too, can be appreciated in the dark.